I got a review copy of the book How To Unspoil Your Child Fast and was quite excited to read it. While I don’t consider any of my children spoiled, I was currently struggling with one of my kids who was clearly in a phase of “disequilibrium”. Actually I have to clarify that statement because I believe most American children are spoiled in comparison with kids around the world. But I digress. This particular child was at a place where s/he expected to get his or her way or there would often be whining or pouting. It seems that the appearance of the book in the mail corresponded with said child growing out of this phase. Sigh. These kids are always changing on us. This situation had caused me some distress for months and then it just improved on its own overnight. Oh well. Nonetheless, the book is excellent and I enjoyed it thoroughly. Without resorting to spankings or yelling, it outlines a plan you can begin almost immediately to unspoil a kid. My favorite chapters were the ones on “Grab Their Attention/Shock and Awe Them“. Basically, these point out that occasionally children need an undeniable reminder of parental authority. This doesn’t mean a screaming Mimi momma fit or grounding for a year. In fact, going overboard or getting emotional at all will ruin the whole plan. This is one of the most difficult parts of unspoiling a child: remaining a calm authority figure. Children lose respect for parents who “lose it” regularly. They learn that they don’t need to obey until mom or dad reaches that point. They learn to ignore us. We’re basically training them not to obey until we rant and rave. Unspoiling your child fast, according to the author, is not about what you do, it’s about what you don’t do. It’s about calmly keeping the child’s allowance back when the child gripes that it’s not enough. It’s about putting the toy back on the shelf when the child begs for two. It’s about not hitting up the Starbucks drive thru for a kid’s hot cocoa every single time you run errands. It’s about not feeling guilty when you take time for yourself and your spouse. It’s about just saying “No”, with love. What unspoiling has looked like in my home: bagging up a child’s toys and placing them in the attic, to be earned back one at a time with good behavior (this came after the child refused to share communal toys, hoarded things and screamed at anyone who stepped into the room). Another time, a door had to be removed from its hinges because of frequent arguments and door-slamming. Twice, I have had to quietly “fire” a child from their chore after they grumbled about it too much. Of course, the accompanying payment was also removed. Both times, the child was asking for the responsibility back within two weeks. In our current culture where people have more wealth and more choices than ever, yet are more discontented and unhappy than ever, this book will help you raise grateful happy kids. The book offers this info in short, easily digested chapters for parents who don’t have much time to read. 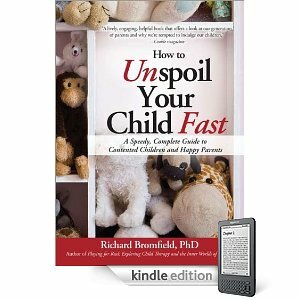 You can grab a copy of How to Unspoil Your Child Fast: A Speedy, Complete Guide to Contented Children and Happy Parents on Amazon. Disclaimer: I received no compensation for this review. I did get a copy of the book so I could read it and write this here review. 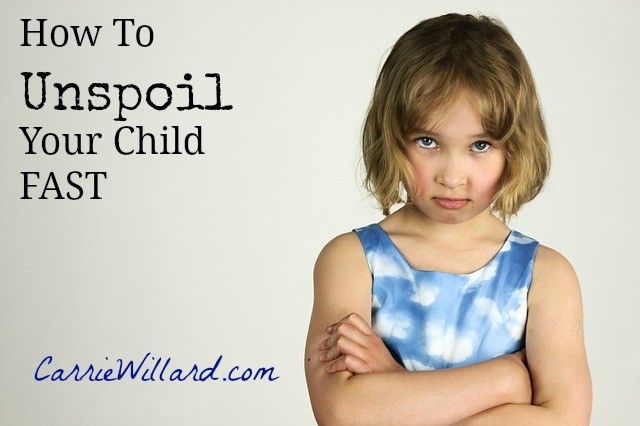 Have you ever had to unspoil your child? How did you go about it? And interview would be great! I think children should be spoiled to a degree. With that said, I think some parents can go overboard giving in to every whim and want. I know my children are spoiled to some degree, but I hope love prevails. Thanks for sharing this review of the book. I’d like to hear an interview with the author.